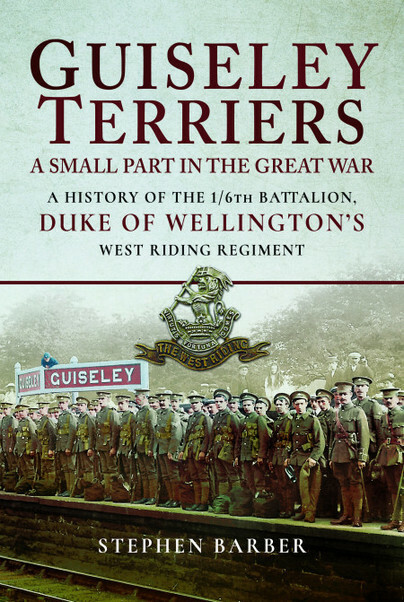 You'll be £20.00 closer to your next £10.00 credit when you purchase Guiseley Terriers: A Small Part in the Great War. What's this? In April 1918, the ‘Saturday night soldiers’ from Bingley, Guiseley, Haworth, Keighley, Settle and Skipton halted the German advance at a critical time in the war during the German spring offensive. Haig’s ‘Backs to the Wall’ order had just been issued when the 1/6th Duke of Wellington’s Regiment was sent to the front-line at Armentières. After nearly four years at the front, they had been transformed from part-time enthusiastic amateurs to battle hardened veterans, having fought in some of the Great War's major battles, including suffering the effects of mustard gas at Nieuport. It was a source of pride to the men of the battalion that they had never given up ground to the enemy, unless ordered to by a higher authority, and only then reluctantly. Using newspaper archives, war diary extracts, personal accounts and previously unpublished photographs, Stephen Barber retraces the formation and history of the 1/6th Duke of Wellington’s Regiment from the creation of the Volunteer Rifle Corps in 1860, to its mobilisation in the Great War. A day-by-day account of their movements and actions over the four-year period culminates in the pursuit of the retreating German Army at Famars, on 1 November 1918. Some great new books from Pen and Sword books: love the WW1 unit histories they publish & this is an excellent one with well researched text, lots of unique images & superb maps. Lots about the unit on the Somme & nice battlefield overlays showing where they fought. Recommended! Faced with a dozen books to review I came to this book thinking it would be just another local history of a unit I knew little about. How wrong was I! This book is a gem. It delivers on the local history magnificently with a rich narrative deep with information on the men of the battalion who served. The sources are good, the photographs placed relevant to the narrative (which I like in this type of book) and I didn’t tire of reading about these men. Also I like that the author has taken the trouble to add information about the weapons and weapon systems he mentions so that the reader has a more rounded view of the events. Clearly the author has not hatched this book from behind a desk – he has visited the battlefield locations and his photographs of modern day locations add to this book’s value. Highly recommended. Stephen Barber is a former soldier who joined the Prince of Wales’s Own Regiment of Yorkshire in 1979 as a 16-year-old. He spent six years in the regiment, serving in Norway, Canada, West Berlin and Northern Ireland. After leaving the army, he joined the Metropolitan Police and was posted to Gerald Road Police Station, near Eaton Square, in central London. In 1992, he transferred to the West Yorkshire Police where he served in various departments including Community Policing, Firearms Support Unit, and as a Detective in the Force Intelligence Unit. Stephen is now retired and spends his time walking in the Yorkshire Dales and assisting as a volunteer at a local pre-school.